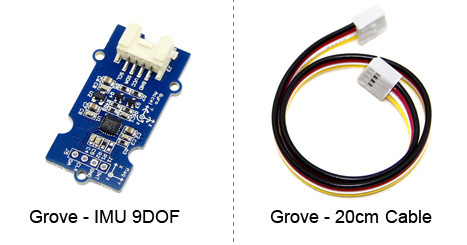 Grove - IMU 9DOF is a high performance 9-axis motion tracking module, which is base on the MPU-9150 chip. The MPU-9150 is the world's first integrated 9-axis motion tracking device designed for the low power, low cost, and high performance requirements of consumer electronics equipment, including smartphones, tablets and wearable sensors. The MPU-9150 also features three 16-bit ADC for digitizing the gyroscope outputs and three 16-bit ADCs for digitizing the accelerometer outputs and three 13-bit ADCs for digitizing the magnetometer outputs. Please see the wiki page for sample code and more information.